Some weeks, it is clear why certain videos pop on YouTube. And then there was last week. For whatever reason, a video from the science-oriented Hybrid Librarian YouTube net called World's 10 Biggest Animals of All Time generated 3.2 million views last week, putting it atop the VideoWatch/VidIQ weekly content chart. The heavy-metal-infused clip took viewers through the history of oversized bugs, mammals and dinosaurs. 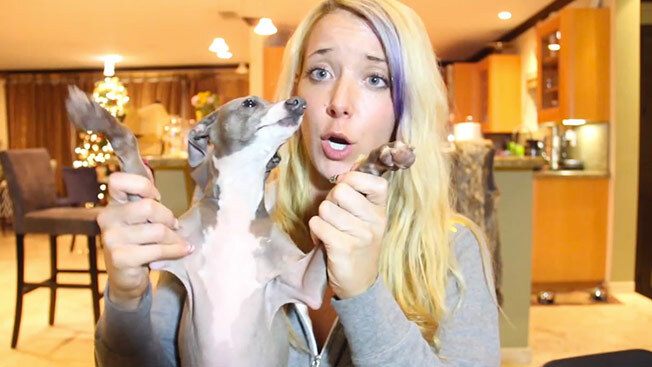 Also noteworthy on the chart was a clip from Jenna Marbles. The video How Fake Tan Works provides a pretty good insight into who this huge YouTube star is, which should either charm or terrify marketers. NOTE: Adweek’s VideoWatch Chart, powered by VidIQ, reveals the Top 10 Web Series Videos on YouTube every week. The chart tracks more than just pure views; VidIQ incorporates sharing data from Facebook, Twitter and YouTube, among other data sources, in an effort to measure true engagement. Every video is also ranked with VidIQ's proprietary score, which helps judge the likelihood of a video being promoted in YouTube Related Videos, Search and Recommended Videos. The ranking is also meant to capture "born-on-the-Web" YouTube content. Thus, material like clips from TV shows, movie trailers, video games and music videos are not included.